The consensus in the national media has been that the 2019 cornerback class is a particularly weak one. While there’s no sure-fire Jalen Ramsey or Marshon Lattimore-esque stud at the top of the class, that doesn’t mean you can’t get yourself a plug-and-play starter. The issues at the top of the class are scheme specificity more so than lack of talent. 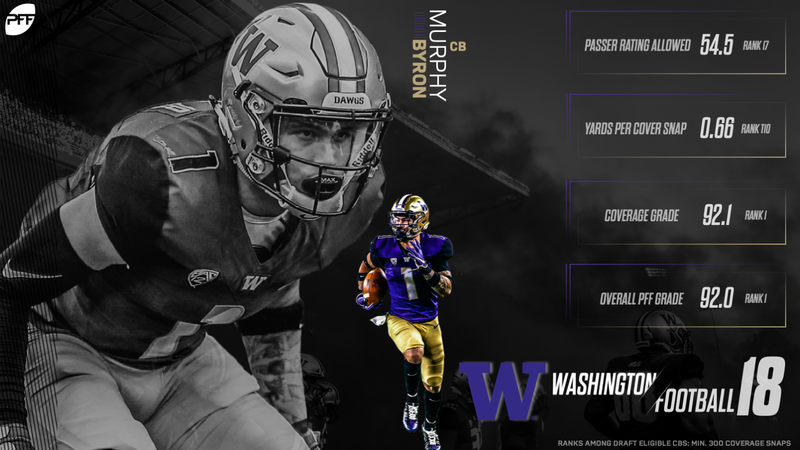 That’s why we still view Washington’s Byron Murphy as a top-10 player in this draft class. He won’t be coveted that highly for every team, but in the right scheme, he could be a dominant player in the league. Playing Madden growing up taught me — and I’m sure a lot of others — that players could be traded or signed by any team and still keep the same overall rating. That couldn’t be further from the truth at a handful of positions in the NFL with cornerback ranking chiefly among them. There is a massive difference between lining up in press coverage then following a wide receiver anywhere he goes on the football field and lining up in off coverage then chucking a receiver at five yards while covering the flat. Both though fall under the realm of possible responsibilities for someone with the positional designation of cornerback. It’s the teams that frequently run the latter and a variety of other zone coverages that should be valuing Murphy in the top-10 of this upcoming draft. Teams that fit that bill the best based on what they’re defensive coordinators have run in recent years are the Panthers, Bills, Texans, Colts, Raiders, Bears and Broncos while a half dozen or so other teams run enough of those concepts as well to covet Murphy’s services highly. Let’s take a look at exactly what I mean when I say Murphy is the best zone cornerback in this class. Zone coverage has far more to do with quickness, instincts and reaction time than it does size, length or speed. That’s why Murphy’s 4.55 40-yard dash at the combine isn’t terribly worrisome to me. Two of the games best zone corners in recent years, Josh Norman (4.66) and Casey Hayward (4.57), ran slower 40s than Murphy at the combine. The elite ones steal back those 1/10ths of a second with how quickly they process route combinations. We saw it again and again with Murphy on tape, and it’s the reason he earned PFF’s highest coverage grade among cornerbacks in college football. His ability to break on routes from off coverage is second to none in this class. It’s why he broke up nearly as many passes (15) as he allowed first downs last season (18). Whether it was coming off his initial receiver in cover-2 like you saw above or playing through the number one receiver in cover-3 like you see below, Murphy closes space and plays the ball at an elite level. If you’re going to be a zone corner, you better be able to come up and tackle, and Murphy proved adept at that as well. He made nine stops in coverage while missing only three tackles on 38 attempts. Of course, there are always going to be situations where a team either needs to play man coverage or needs their corner to stick with someone one-on-one. There’s zero chance we’d put a cornerback top-10 on our board if we didn’t think they could do that at a high-level as well. We saw Murphy tasked with playing press man coverage on a good number of snaps this past season at Washington and he excused himself admirably. His lack of size and length could be an issue for him against larger receivers in the NFL, but his feet and hips are still exceptional from a press position. Any team that likes to play matchups with their cornerbacks could easily stick him on a smaller, shiftier wideout and not think twice about it. What’s maybe the most impressive thing about Murphy is how well he already sees the game at such a young age. The redshirt sophomore only just turned 21 in January and played only 334 snaps in 2017 (earning an 89.6 coverage grade on those snaps). There are 10-year NFL veterans who can’t make the kinds of plays Murphy already can. He won’t be for everyone, but in the right system, Murphy is worthy of a top-10 pick.